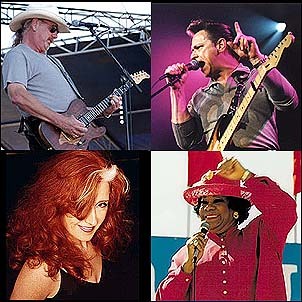 For a one-time performance, Ray Benson, Ruth Brown, Bonnie Raitt and Jimmie Vaughan will perform May 28 at The Backyard in Austin, Texas to benefit the Rhythm & Blues Foundation Pioneer Honorees for 2003. Recipients of the funds raised include Clarence "Frogman" Henry, Johnny Nash, Koko Taylor, The Del Vikings, The Supremes, The Dixie Cups, George Clinton, Maceo Parker, and the family of Jackie Wilson. Dionne Warwick was the 2003 recipient of the Lifetime Achievement Award. "A number of years ago Stevie Ray Vaughan, Sam, Dave, and many others did a benefit concert in Austin for the then newly formed R&B Foundation, "said R&B Board Member Benson, founder, lead singer and lead guitarist for Asleep At The Wheel. "Since then the Foundation has given out almost $3 million in direct grants to legendary Rhythm and Blues artists and funded dozens of concerts by these great pioneers of R&B. The foundation ran a little low on cash this year, so Bonnie and I figured we'd come back to Austin to 'Do a show and raise some dough!'" Limited VIP tickets are $250 and include a meet & greet reception with performers after the show, special seating, private bar service and VIP parking; $150 tickets that include Tree Deck seating, private bar service. Other reserved ticket prices are $60 and $45; and $35 for general admission. The Rhythm & Blues Foundation was founded in 1988 and has been the only independent nonprofit service organization solely dedicated to the historical and cultural preservation of Rhythm & Blues music. The Foundation provides financial support, medical assistance and educational outreach through various grants and programs to support R&B and Motown artists of the 40s, 50s, 60s, and 70s.